RENTAL - Palos Verdes Ballet Company Presents "The Nutcracker"
Palos Verdes Ballet’s talented pre-professional dancers will dance in the snow and candy caned stage with guest artist Priit Kripson from the Royal Ballet of Flanders and Stephan Azulay from Canada’s Royal Winnipeg Ballet. Pritt Kripson will portray the role of the magical and mysterious “Dr. Drosselmeier”, while Stephan Anzulay will sweep away “Marie” to the Land of Sweets where the loving couple will dance the renowned “Grand Pas de deux”. 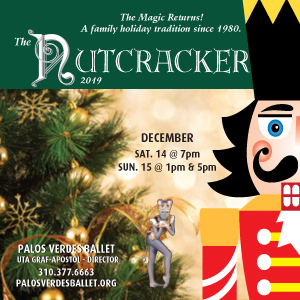 Founded in 1955, Palos Verdes Ballet is the oldest established classical ballet company in the South Bay, with an extensive history and reputation for creating talented, strong classical ballet dancers. For more information on how to become a part of the ballet legacy of the only exclusive classical ballet studio on the Palos Verdes Peninsula, please call 310-377-6663. Additional information is also available at www.palosverdesballet.org.